When a buyer decides to make an offer on a house for sale in Maryland, that buyer must also decide what inspections to have conducted. Inspections are included in the initial offer, along with a timeframe of when they will be completed. Home inspections occur shortly after going under contract to buy a house in Maryland, typically within the first 2 weeks. Inspections allow the buyer to learn about the property before purchase. Not only are negative issues discovered, but also positive features and tips on future maintenance. One type of inspection that is often conducted when buying a house in Maryland is a radon inspection. If a house has a basement, a radon inspection is especially recommended. Buyer, at buyer’s expense, has the right to have the property tested for radon in accordance with the Environmental Protection Agency (EPA) testing protocols to determine whether the radon level (or average radon level if the test results are reported as an integrated average over time) equals or exceeds the action level as determined by the EPA. Such testing shall be completed and in the event the radon level equals or exceeds the EPA action level, a copy of the test results together with a separate written statement indicating what corrective action is required, shall be submitted to seller within _____ days from the date of Contract Acceptance. Let’s take a look at the specifics of a radon inspection during a real estate transaction and answer some frequently asked questions…. Is There Radon in Maryland? Is Radon Testing Required in Maryland? Why Do Buyers in Maryland Want A Radon Inspection? How is A House Tested for Radon in Maryland? What Happens if a House Has a High Level of Radon in Maryland? What Does a Maryland Home Seller Have to Do if the Radon is High? Radon is radioactive, invisible, tasteless and has no odor. Radon is found everywhere. Radon also causes cancer when a person is exposed to elevated levels over a period of time, usually years. It is emitted from the natural breakdown (radioactive decay) of uranium in rock and soil. It can also occasionally be found in well water. There are no signs or symptoms of radon in a house that are detectable without testing. The only way to detect radon in a house is through radon testing. Separate well water testing is necessary to determine if there is radon in the water. Radon gets into a house by rising out of the ground into the air. It enters houses through cracks and holes in foundations. A common route of entry into a house is through a sump pump. The radon gets trapped and the levels can rise. Areas of a house that receive ventilation (open doors and windows) can be less of a threat. Radon gas is heavier than air. This means basements are the areas that tend to have the highest levels, because those areas are typically not well-ventilated. Is Radon a Problem in Maryland? Radon can be found throughout Maryland, although some areas are known to have higher levels than others. There is no way to predict whether a particular house has high levels of radon. One house can have low levels, while the house next door can have high levels. The level of radon in a house is entirely dependent on the presence of rock under the house, and whether there are points of entry. This map of Radon Zones in Maryland shows areas where radon has been found in higher levels. When buying a house in Maryland, radon testing is optional, EXCEPT in Montgomery County. A new law went into effect in Montgomery County, MD on October 1, 2016. That law requires radon must be tested and the test results must be less than 1 year old when a house or townhouse is being sold. Some Montgomery County homeowners will go ahead and have the radon tested prior to listing their house for sale. If they do not, the buyer will need to have radon testing performed. Why Do Home Buyers in Maryland Want a Radon Inspection? Some Maryland home buyers are concerned about the potential health effects of radon in a house. There are no symptoms of breathing in radon, even if someone breathes it in at high levels over a long period of time. Elevated levels of radon are known to cause lung cancer. As a matter of fact, radon is the overall #2 cause of lung cancer in the United States. Smoking is the #1 cause of lung cancer among smokers. Among non-smokers, radon exposure at high levels is the leading cause of lung cancer. When radon decays in the soil and enters a house over a long period of time, the byproducts of that decay can be inhaled and end up in the lungs. This can lead to changes in the cells, which can then cause cancer. How is Radon Tested in Maryland When Buying a House? Even though radon test kits are sold in stores like Home Depot and Lowe’s, a licensed inspector must perform the radon inspection / testing when someone is buying a house in Maryland. Most home inspectors also test for radon, so a separate inspector is typically not needed. The average cost for a radon inspection is $150, although it is always recommended to ask about the cost before scheduling the inspection. The testing must be done in accordance with the Maryland Contract of Sale. The terms of the contract will determine how quickly the testing needs to be completed AND the results received by the the buyer. If a Radon System is Already in A House, Should a Buyer Still Have the Radon Levels Tested? The decision is ultimately up to the buyer. However, the only way to know if the system is working properly is to have testing done by a licensed inspector. There are 2 different ways radon is tested. The method used is a choice of each inspection company. Some companies prefer one method, other companies prefer another method. Regardless of the method used, the radon level will be determined. It is important that windows and doors remain closed during the test period. Otherwise, the results will not be accurate due to ventilation. It is also important that testing equipment is not disturbed. Moving the equipment will create air flow that can cause false test results. 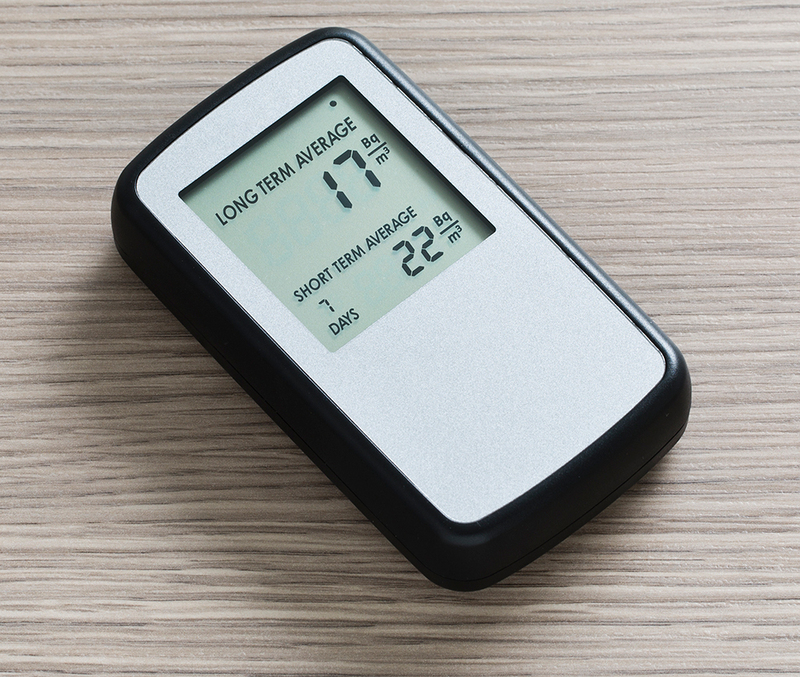 Some radon inspectors prefer using a portable radon gas monitor that provides immediate results after the testing is completed. The cost of the equipment prohibits some inspectors from using this method of testing for radon in Maryland. The radon testing monitor is placed in the lowest point of the house. If a house has a basement, the monitor will be placed there in a spot where it is not in the way. If there is no basement, the monitor will be placed at ground level. The monitor will be left, undisturbed, for a minimum of 48 hours. The monitor will collect continuous air samples. The inspector will be able to immediately access the results when the monitor is retrieved. Another type of testing device used for radon testing is the charcoal canister. This method is more cost-effective, and is frequently used by radon inspectors. Homeowners usually wonder where the radon test will be placed. Two (2) small, round charcoal canisters are placed in the lowest points of a house. Placement is the same as for portable gas monitors discussed above. The canisters will remain, untouched, for a minimum of 48 hours. After testing is completed, the inspector will typically mail the canisters to a lab for evaluation. The results are usually available within a few days. Unlike the gas monitor, canisters require evaluation and the results are not immediate. Some inspectors, however, have the lab equipment to determine the results. These inspectors can provide the results as soon as they process the canisters. What is an Acceptable Radon Level in Maryland? Radon levels are measured in “picocuries per liter”, otherwise known as “pCi/L”. The EPA has determined the “Action Level” for the entire United States is 4.0 pCi/L. This means any radon level of 4.0 pCi/L or below is considered an acceptable radon level, regardless of whether the test is done in Maryland or another state. Any reading above 4.0 pCi/L is considered “not safe and requires action” according to Environmental Protection Agency. What Happens if a Radon Level is High in Maryland? If the test is positive for radon and elevated radon levels are reported, a Maryland home buyer can ask the seller to have the radon level mitigated and reduced to an acceptable level. There is no established level of radon that absolutely requires mitigation. There are currently no laws in Maryland that mandate mitigation above a certain radon level. The decision of whether to mitigate or not mitigate is left to the buyer and seller. Rarely is the radon completely removed due to the constant decay of rock in the soil. However, mitigation systems do work. They reduce the radon below the Action Level determined by the EPA. The buyer, with the help of the buyer’s agent, will need to put their request in writing on a form known as the “Property Inspections Notice”. The buyer’s agent will give the request to the seller’s agent. A copy of the radon test results will need to be submitted as well. The seller will want to see proof of the elevated radon levels in his or her house. What is a Home Seller in Maryland Obligated to Do if the Radon Level is High? A home seller in Maryland is not obligated to do anything if the radon level is reported as higher than the action level established by the EPA. (Remember: the action level is that level where taking action is recommended). The seller has 5 days to make a decision. The only way to reduce radon levels in a home is to have a radon remediation system installed. The 5-day time frame allows the seller to obtain estimates on what it will cost to have the radon remediated. A licensed remediation company will be required to do the work, the seller will not be able to do it himself, nor have a friend or relative do the work. If the seller decides to remediate the radon, the licensed company will install a radon system, give it time to work, then re-test the radon level to be sure the system is indeed working properly and fixing the radon problem. After this is done, the seller pays for the radon system and will need to provide a copy of the paid receipt to the buyer, along with a copy of the re-testing results. All of this needs to be competed prior to settlement. If the seller decides NOT to have the radon remediated, the buyer can either go ahead with buying the house, or can back out of the contract to buy the house. If the buyer backs out and cancels buying the house, the seller will have to disclose the high level of radon to other potential buyers. When this happens, it can be very difficult to get the house sold. Radon is a serious concern for many home buyers in Maryland. They are concerned about the health effects and the chance of developing lung cancer when radon levels are elevated. Home buyers who have children are especially concerned about radon. Many buyers choose to have a radon inspection completed as part of their home inspection. The EPA has determined a recommended action level. Home buyers compare the actual test results with the recommended action level when deciding what to do about elevated levels. When levels are elevated, buyers have the right to ask the seller to have a radon mitigation system installed at the seller’s expense. Sellers have the option of either having a radon system installed by a licensed radon mitigator, or can decline to have a system installed. However, when sellers refuse to have a system installed, the buyer can back out of buying the house. The sellers will then have to disclose the elevated level of radon to other potential buyers after they put their house back on the market in Maryland. This disclosure can make it hard to sell a house that is known to have a high level of radon.